If there is one thing I’ve discovered while monitoring my own finances through the years it’s this – the future is friends with worry. It’s inevitable – at some point I will worry about money. I think a lot of you are right there with me…worrying about money for retirement…worrying about how to budget for the monthly bills…worrying about career options, housing options, how to pay for college, and having enough to buy those Christmas presents. If we are not careful we end up exhausting ourselves when we worry about money. Worry seems like a selfish act in that it places the whole burden on me. I’m the only one that can make it happen. I have to manage all the details. I need foresight into all the external factors that may arise so that I can juggle my decisions to achieve the desired outcome. In reality, there is someone in my corner who knows my needs far better than I. And I can rest my worry about money (and all things really) at His feet. Therefore do not worry, saying, ‘What shall we eat?’ or ‘What shall we drink?’ or ‘What shall we wear?’…For your heavenly Father knows that you need all these things. But seek first the kingdom of God and His righteousness, and all these things shall be added to you. I love the line that closes out the passage. It should sum up our mindset, don’t you think? Focus on today’s events and leave tomorrow for tomorrow. Keep in mind, Jesus isn’t saying “Don’t plan.” He’s simply challenging us to monitor our emotions as they relate to our future plans. Agonizing over things we cannot control or events that may never happen will be counterproductive to living a joyful and fulfilling life in the moment. Plus, I think there is great value in being mentally and emotionally present in the moment. When our minds are so focused on tomorrow we often miss opportunities in the present. The chance to make a connection, solve a problem or help someone in need pass us by because we are worrying about events down the road. God created all that we see. He owns it all. And He’s concerned about it all, right down to the lilies of the field. They are beautifully adorned. They grow by drinking in the rain and bathing in the sun that is provided to them on a daily basis. They have no cares other than to exist and enjoy the life given to them but for a short time. If God cares for a simple plant in this way, why do I think He won’t provide for me? Do I not have more value than they? Is my faith that shallow to assume God is overlooking my needs? I plan to always have food to eat, clothes to wear and a roof over my head. I hope all the decisions I’m currently facing will work themselves out satisfactorily. I anticipate the financial plans I’m working to be successful. But whatever the outcomes I need to lay my worry down about them. It’s a burden not worth carrying. Questions: Do you ever find yourself getting wrapped up in worry about money…or anything else? How do you deal with it? What’s the biggest thing you worry about? It’s really inevitable that I worry about the future. But, I am really learning not to but to focus on what I have today. Brian, your bible verses are really eye-opening and relieving. What I do is that I think of God who will and can take care of the future. I just put my faith in him, which makes me have the feeling of security I need. That really is a great verse for the day-to-day challenges we face as humans. I have been trying to be more intentional about digging into the word and thinking about the mortality we experience as humans. It’s easy – and natural – to be afraid of death, disasters, etc., and really the only way to feel at peace with those sorts of things is to look to the word. Otherwise you can end up spending all your time worrying. I hear you DC. Those tragedy-type things are easy to worry about. I think because they are so spectacular in nature we tend to build them up in our mind and worry about them more. 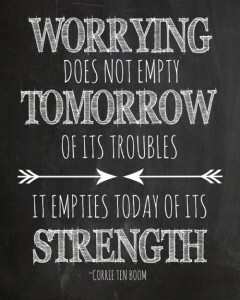 I think that worrying is a pain that is necessary sometimes if we want to get things done and move forward in life. Great article! Thanks Simon! For me the concept of worrying goes beyond simply thinking about how to solve a problem. In my eyes worry means getting so emotionally upset about an issue that it affects your thinking and disrupts your day. And so often it’s worrying over things out of our control that we have no way of impacting. I am a worrier so this is one of my favorite verses as well. It’s sort of a bonus that it’s in a financial context, but it’s great to apply to any worry. I know God has already done for me everything that I truly need in the Gospel. As I’m sure you know, there is so much teaching in the Bible tied to money. It’s comforting to know that God looks on us with such care. He definitely knows our every need and we should trust Him for that. I did worry about money in the past but we are now financially ok so when I worry it is about health. As a cancer survivor (13 years cancer free….hooray), I always worry about the disease returning. But each time I get a good report, I have a few months before I start worrying again. It is very draining. My biGgest worry is often money, but there’s a fair dose of worry about being a good parent, who is raising my children to walk in God’s way. When I worry about money, I find this passage very comforting, but there’s nothing that eases the worry of being a Godly parent. But this is a more constructive form of worrying, as it spurs me to action. I can relate to worrying about being a good parent. That’s one of my biggest goals is to see my children grow up to be Godly men and women. Sometimes I feel as though I’m not doing enough in that regard to help them.